This is a fairly simple report that comes up in the new window and this is a small twist to a previous example. The twist is that we allow the user to select the title of the report within the script. I’ve added the field to the example layout but normally, you wouldn’t do that. 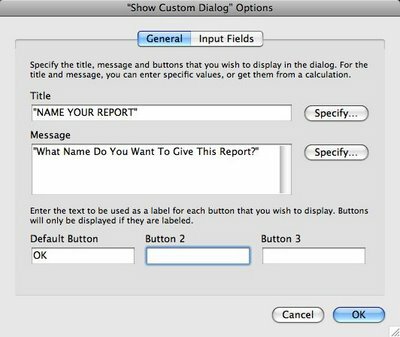 Instead, you would use the Custom Dialog Message script step to allow the user to type in the report name. That is what happens when you click the Run Report button in this example. 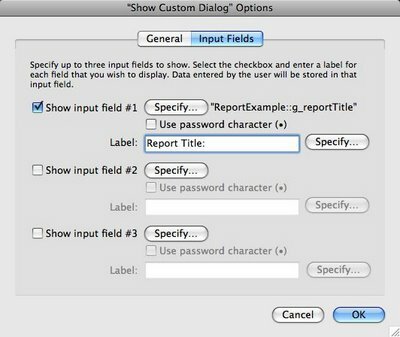 The Show Custom Dialog Box step has the ability to allow a user to add data to up to 3 fields directly from the dialog box. Other features include the ability to use literal text or a calculation to show the dialog box title, the dialog box main message and the labels for the input fields. Basically, the report title is a global text field. So it will be user session specific and still allows the user to customize the report title for their needs. You can use this technique in other areas of your report, to spruce it up as well. Here you can see the first step in defining your show custom dialog with the title of the dialog box, the message content and the buttons you want to show. Here you can see the second step in defining your show custom dialog the selection of what data fields you want the user entering data into and the label for each. Here you can see the resulting dialog box that comes up when the script is executed. 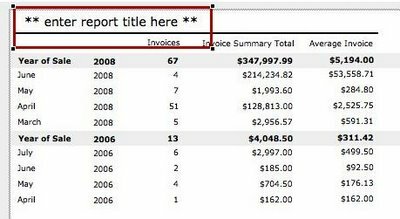 Here you can see report title equals what the user typed in, the global text field is a merge field on the report layout. We only have two data fields which include an invoice date and an invoice amount. What we want to do is show a report that summarizes the invoice sales for each year and then further broken down by the month of the year. The report will run on the found set of records. So you can do a find for a particular set of records and then run the report. There are two sorted by subsummary layout parts the sort fields uses are both calculation fields. The first is year of the sale and the second is the month of the sale. There is a script that runs the report in a new window and a subscript that handles the report printout actions. Clicking the Run Report button will activate the report. You might want to have the script debugger running if you have FileMaker Advanced installed on your machine. That will allow you to see the individual script steps execute one at a time from the script debugger window. Newer PostDude, you like mentioned FileMaker twice!